This contemporary barn conversion is set in the rural hamlet of Damerham. Set at the end of a long drive this is the ideal base for time spent exploring the New Forest National Park where you will find a plethora of routes ideal for walking riding and cycling. The local area is home to free roaming ponies and cattle which can be admired whilst en-route to one of the many country pubs nearby. Ideally placed for exploring Hampshire Dorset and beyond from here you can visit many popular attractions including Stonehenge Beaulieu Bucklers Hard and the cathedral city of Salisbury. Also accessible by car is the waterside town of Fordingbridge and Lymington with its pretty cobbled streets and bustling harbour. A shared driveway unmade in places leads you to the main entrance into this detached property which opens into a stunning open plan lounge/kitchen/diner. This spacious room has been cleverly designed to create a fantastic sociable space with all your comforts considered. 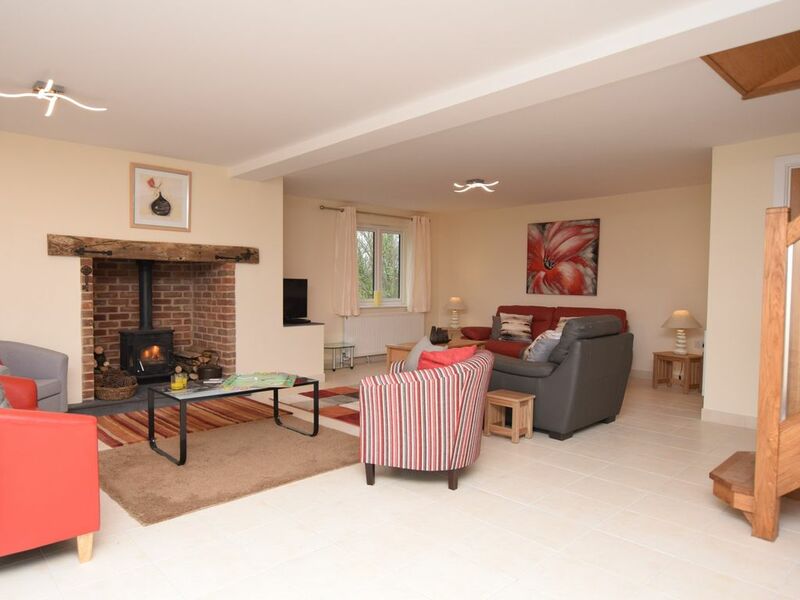 The lounge area has a Smart TV DVD and wood burner making it the perfect spot to relax after a day spent exploring. Here you can throw open the doors to the garden and enjoy leisurely meals at the dining table. The open-plan kitchen area is well-equipped with an electric oven and induction hob fridge with ice compartment and microwave. Just next door is a useful shower room with utility area including a fridge/freezer washing machine and dishwasher. Also on the ground floor is a useful separate WC. Heading up the stylish oak staircase you will find a galleried landing leading to the three bedrooms. One is a spacious double and has views over pastureland doors opening into a Juliet balcony and en-suite bathroom with bath and WC. Adjacent to here are two further bedrooms one with a Juliet balcony and a double bed the other with a bunk bedroom a double with a single bunk bed above. Both rooms share the bathroom which has a shower over the bath further separate shower and WC. Due to the vaulted ceilings all first floor rooms have some areas of restricted head height. Heading outside there is a patio with garden furniture offering the perfect spot for a relaxed meal with views over pastureland and an unenclosed lawn. There is off-road parking space available for two cars to the rear of the property accessed through the farm yard.